Yes, I'm still tatting, but I've been playing so much with my computer that I haven't finished nearly as much as I could have. So, in an attempt to get back to my tatting, I'm sending out a plea for help. You see, last year when I changed the look of my blog, I lost my special badges... Tatted Ring of Bloggers, InTatters, Blog Queen 2009... and I can't figure out how to get them back on my blog. Does anyone out there have any ideas on what I need to do to put them back in their rightful place? I finally finished the second section of Primrose Path by Mary Konior. I was almost finished with this section when I realized I was short one section of chain on the first round! So, I cut out all the blue and re-tatted. 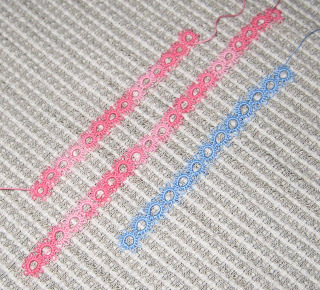 I find tatting lots of chains to be pretty boring, so this took me longer than it should have. Anyway, I'm ready to start the last section, and I'm really liking the way the pattern goes together. 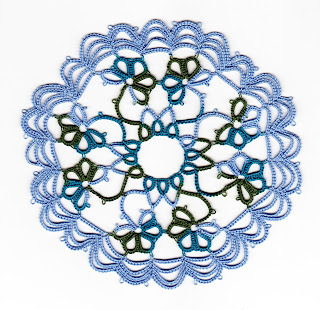 Primrose Path is from A Pattern Book of Tatting by Mary Konior. The thread is size 20 Lizbeth: inner section color #117, outer section color #651. While waiting for my new Lizbeth threads (yes, they came! 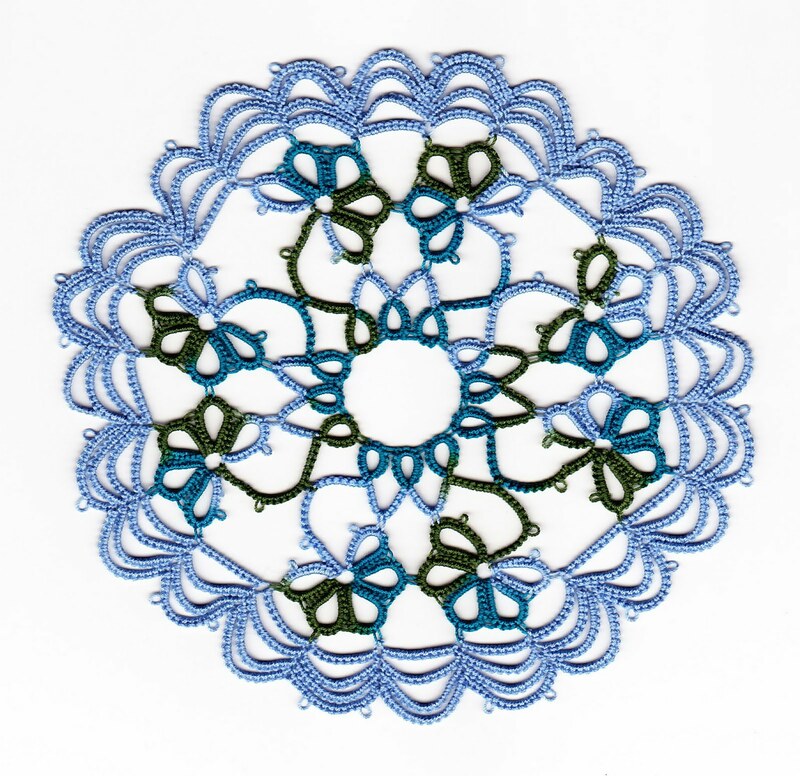 ), I decided to play some more with the center of Primrose Path from A Pattern Book of Tatting by Mary Konior. I think it was Sharon who wrote about the importance of paying attention to where you start when working with variegated or multi-color threads. I never really thought about that idea until I read the blog post, and this is the first time I paid attention to where in the color change I began the motif. The center of this doily is actually four motifs, and I did pay close attention to where I started each one. Looking at the two, I think I prefer the way the color flows on the right one (the left one is the first one I tatted). I'm not sure I like the turquoise and light blue in the center, though. I may tat another center to see if I can get some green in those center rings. Then again, maybe I'll just finish the ones I've started! Well, I successfully cut out and replaced the offending section and declared that the center of this doily looked much better! Then, much to my dismay, I discovered that I had tatted another section incorrectly. Not a big deal... I've become a pro at cutting out offending sections! Alas, when I cut that section out I discovered that I was missing two picots that I needed for joining. I'm sure there is someone in tat-land who can see where I made do, but I'm not going to worry about it. As mentioned earlier, I headed for my Lizbeth stash to find a coordinating color for the next round. Believe it or not, I did not have the correct color! Horrors! I had to order more thread! It should arrive today or tomorrow. In the meantime, I've started tatting the center again, this time starting my ring at a different color section. I just want to see how different it will look. I probably won't get any more tatting done until next week. It's play weekend! Daughter Carol is directing Back to the 80s: the Totally Awesome Musical! I got a bit of a sneak preview last night when I drove in to mend a dress. There is a lot of excitement about this production. Dessert theater tickets sold out! In fact they over-sold, and Carol had to borrow tables, dishes, and flatware. Tonight I'll go in early to take backstage pictures. Tomorrow morning we'll set up for the dessert theater. Some friends are coming down for tomorrow night's performance. Then on Sunday, daughter Alison and her family will be coming down. I guess I should have done my laundry last night... there sure won't be much time over the weekend! 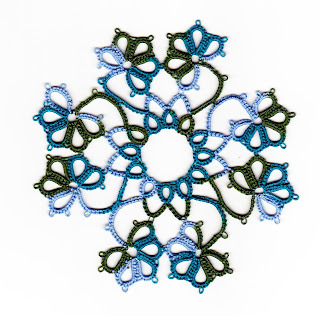 I was browsing through A Pattern Book of Tatting by Mary Konior and thought Primrose Path would be a fun doily to tat. This is the center motif in Lizbeth size 20, color #117. I guess I'd better go find my Lizbeth stash to find a coordinating color for the next round! Oops! Now that I've looked at the picture close up, I see that I attached one of the four motifs backwards. Oh, well! I'll pay closer attention next time. UPDATE! The motif that is backwards is also missing a section of chain. So, I cut out the bad section and I'm redoing it. I'm so glad it will look right! Dec. 30, two years ago, I slipped on a patch of ice in my driveway. I broke my wrist in eleven places, and I had surgery on New Year's Eve. I have a t-shaped plate in my arm with eight screws holding it in place. Luckily, with great care from my doctor and several months of occupational therapy, I have the use of my left hand. I can't turn my left hand with the full range of motion that I have with my right, but I can tat, knit, and crochet as long as I don't overdo it. My left hand sometimes goes numb, and sometimes I just can't seem to get it warm. I can't always make my fingers work the way I want them to, and I don't have as much strength in my left hand. Believe me, I'm not complaining! I am very grateful that I have the ability to do most of my favorite things with ease. I think maybe God was telling me I needed to slow down! 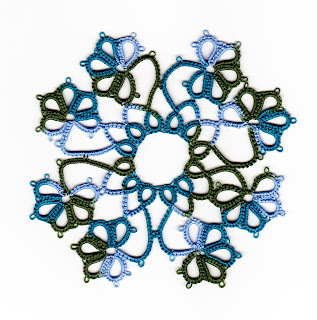 So, I'll keep trying to do things like tat split rings, but if it doesn't happen, I'll be satisfied with seeing what all of my wonderful tatting friends are able to accomplish! Joanne's doily is complete! The pattern is "Hostess Set: Placemat" from Tatting Patterns by Mary Konior. The thread is Oren Bayan Size 50, color #066. Although this doily took me quite a while to complete, it was really very simple. I wanted to empty some shuttles, so I tried another pattern from this book. This is "Simple Simon"... very simple, indeed! When tatting this, you leave a length of thread the size of the ring in back of the piece. As I was tatting, I thought it might work well as a split ring pattern, eliminating the length of thread on the back. My left hand would not cooperate today. I just couldn't hold the thread in place to make split rings. I hope someone who is competent with split rings will try this pattern as a split ring to see how it looks. I'll try again, but my split ring days really are hit or miss. This week I received this beautiful knit postcard from Shirl at shadetreeart.com. I love it! I never would have thought of doing something like this. What a great way to use up bits of yarn! ...and I do have quite a few "bits" of yarn lying around the house! Joanne's pink doily is on the blocking board, so I decided to try out my new Pop-A-Bobbin shuttle. If you like Aero shuttles, you'll love this little gem! It is so smooth and light weight! 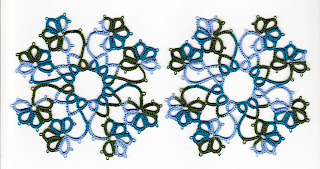 The edging is from Mary Konior's Tatting Patterns. Yes, I love this book! The thread was just sitting on the table next to my chair. I'm ready for spring, so the color suited my mood. It's Flora, size 20, color #228. Did you notice the pretty red bookmark? It was a Valentine's gift from daughter Alison (Squeaky Alligator). She makes beautiful Kumihimo braids!